When 11-year-old Riley Clarke woke up Tuesday morning, he had no idea the kind of day he was in for. 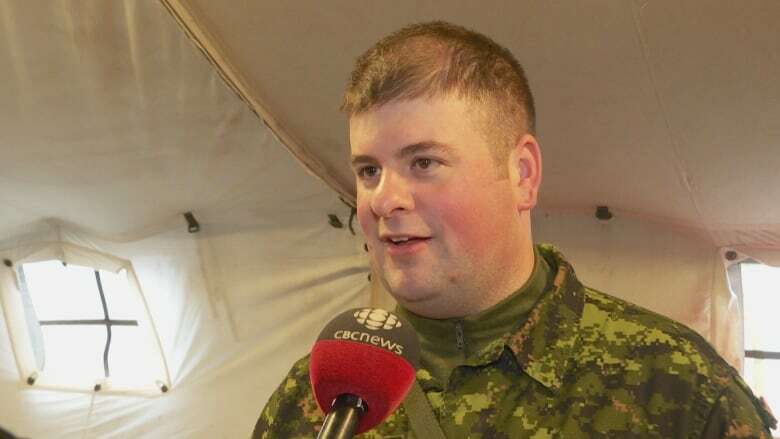 While most kids his age were busy learning math and English, he was piloting a military robot at a temporary military base on Prince Edward Island. When 11-year-old Riley Clarke woke up Tuesday morning, he had no idea the kind of day he was in for. While most kids his age were busy at school learning math and English, he was piloting a military robot. 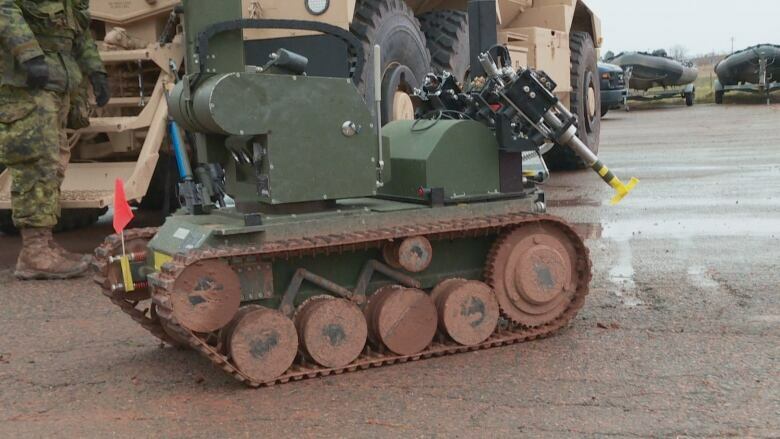 "Apparently it's supposed to be a land mine detector," Riley said. "I just kept turning it around and driving it forward toward mom. I harassed my mother with a robot!" 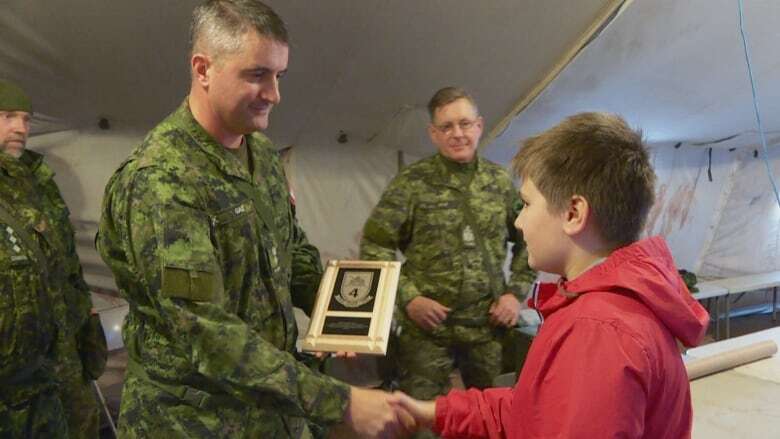 It's not an opportunity the Canadian Armed Forces gives to many 11-year-olds. 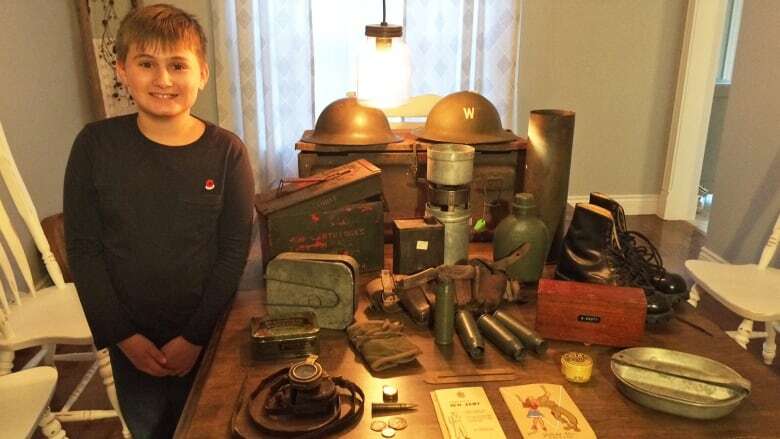 The Summerside boy caught the Forces' attention a year ago, when CBC told the story of his impressive collection of Second World War artifacts. Riley made it his personal mission to find and preserve as many artifacts as possible, after learning his great-grandfather had served in the war. 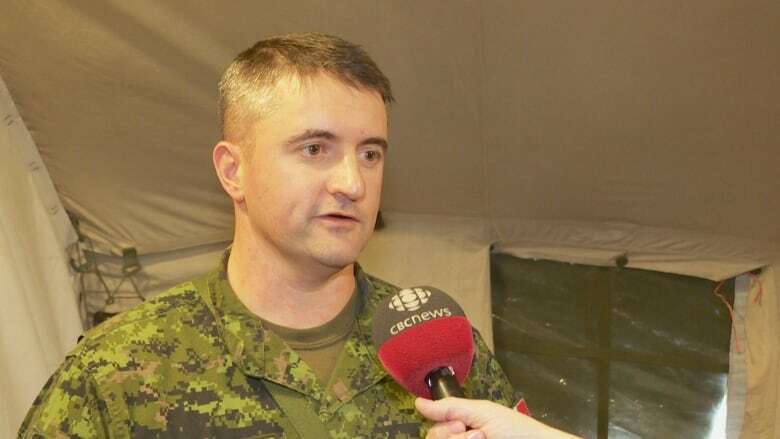 "He's an amazing young guy," said Lt.-Col. Jason Gale. "Not all 11 year olds are receiving artifacts from across the country to remember military members. So that was striking to us, when we read the articles about what he's done already." 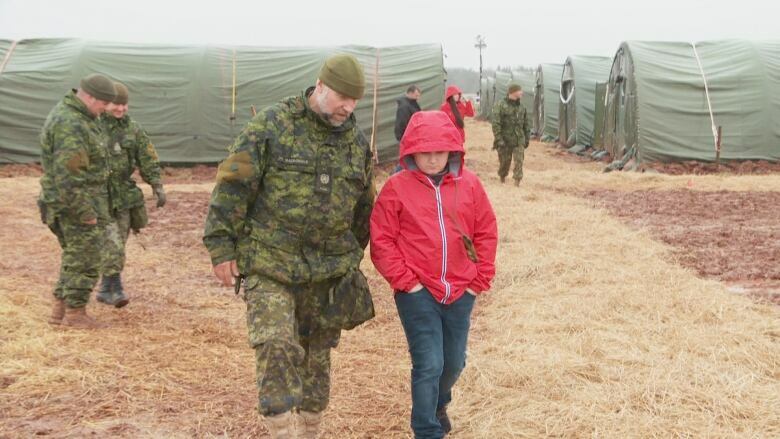 So when Gale and 450 other Canadian Armed Forces engineers descended on P.E.I. for a month of training exercises, it was an easy decision to invite Riley to their massive base camp at Slemon Park, and give him the VIP treatment. "We make it a point to reach out to important people in the community," explained public affairs officer, Capt. Jamie Tobin. 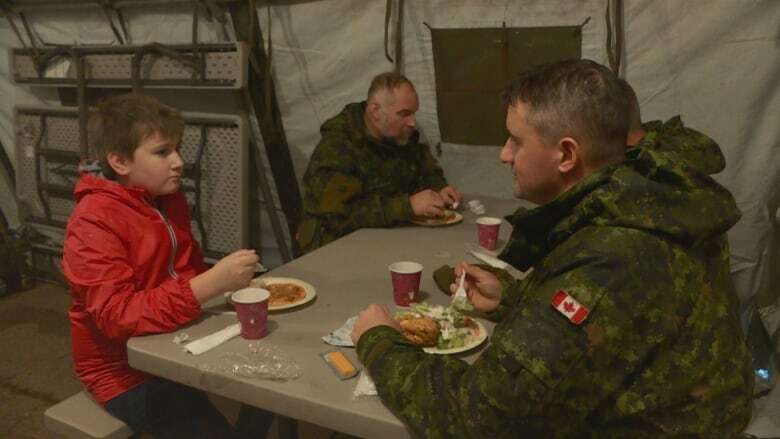 "On that list, we've invited the lieutenant governor of P.E.I., we've invited the premier, and the deputy minister of veterans affairs. But at the top of that list was Riley Clarke for all the advocacy he does for the military, preserving that military history. He's doing more than many of our soldiers, to tell the story of our past." Riley wasn't just rewarded with a tour of the camp. He was named deputy commanding officer for the day. "It felt weird being called sir. I'm only called Riley. Never in my life have I been called sir," the young historian said. On top of getting the exclusive tour, piloting the bomb-detecting robot, and eating lunch with soldiers in the mess hall, Riley was also presented with a handful of souvenirs, and a special plaque. 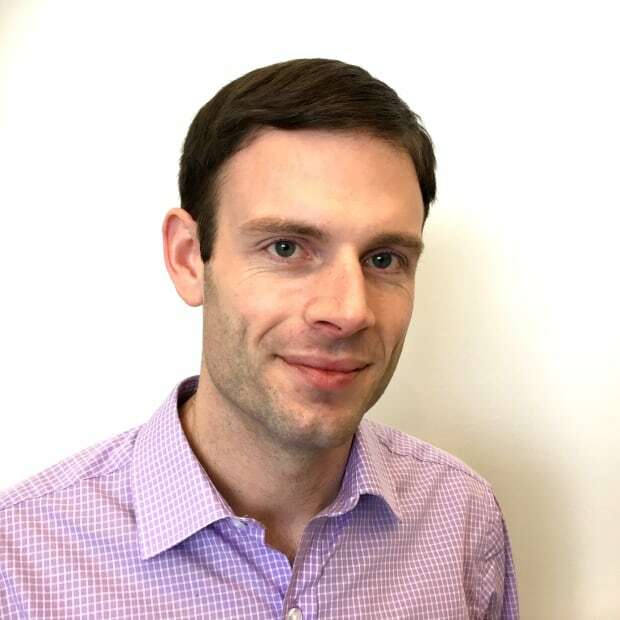 It recognizes his great-grandfather's service in the Second World War, and his own efforts to preserve military history. "It's cool to have a plaque," Riley said. "I'd like to thank the soldiers very much ... for inviting me into their camp. I think the world could use soldiers like them." Tight races lead to late night in municipal elections on P.E.I.